After a life-long love of animals and more than 15 years experience in the pet and veterinary industries , I became a Certified Professional Dog Trainer from the Arizona Canine Academy. Shortly after I began training dogs professionally, it became clear that my client base was comprised of people from every walk of life with dogs as diverse as the owners. Each had their own goals, ideal or issues to work though with their pet. It seemed that no two appointments were the same. It was then I realized a different type of training was needed. A type of training for real life scenarios, delivered in everyday terms that anyone could use. A type of training that people could relate to and remember how to use. The first challenge was to acknowledge that the training was as much, if not more for the human part of the equation than the canine. It became apparent that most people didn’t know the rules of being a dog. That’s right. Dogs have rules too. Just like when people communicate with people, there are certain rules to communicating effectively with dogs. 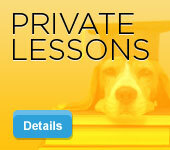 Now after 1,500 dogs, DogWisdom provides more than just “dog training”. We offer the insight and information to take effective training methods and make them part of everyday life, and greatly improve communication with your pet. We seek to enhance the human-dog relationship every day. Anyone can teach dog-training methods, but only one brings you DogWisdom. © 2018. DogWisdom. All Rights Reserved.